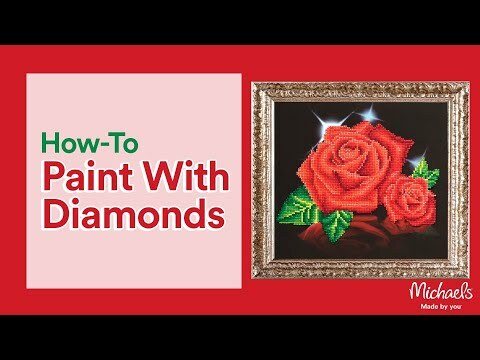 This all-inclusive beginner level kit comes with everything you need to complete the Love 5D diamond painting design. It includes high quality color printed fabric, Diamond Dotz pre-sorted by shade, Diamond Dotz stylus, craft tray, wax caddy and complete instructions. If the fabric becomes soiled during the working process it can be cleaned by gently wiping (avoid scrubbing) with a soft damp cloth. (Use cold water). When your design is complete, lay the protective film over the top of the diamond area and (using a cylindrical container (glass bottle or rolling pin)) gently roll over to secure the diamonds on the sticky surface. Diamond Dotz® Love is rated 5.0 out of 5 by 2. Rated 5 out of 5 by gktilton from Love this project! Spent a little over an hour working on this today. Found it to be a perfect " no thinking required" project. Very calming and relaxing. Rated 5 out of 5 by NiecyE from Fun as a starter... I heard about this new craft & wanted to try on a small scale & this was perfect.